Myoung Soo Lah attended Seoul National University, Korea, for his BSc and MSc and earned his PhD in chemistry from the University of Michigan, Ann Arbor, in 1991. 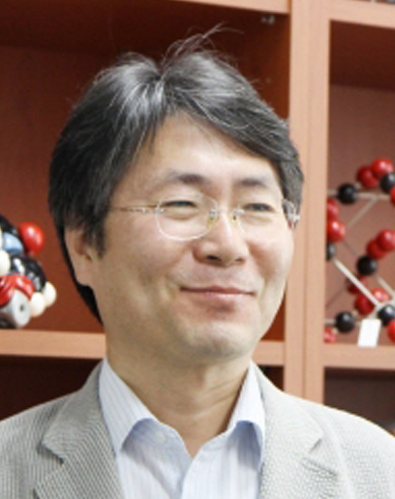 After his postdoctoral research in macromolecular crystallography from the same university, he became a faculty member of the department of chemistry, Hanyang University in 1992 and then moved to Ulsan National Institute of Science and Technology in 2010, where he is presently a professor of department of chemistry. He is interested in the development of metal–organic systems such as metal-organic polyhedra and metal-organic frameworks for the applications in the areas of storage of energy materials, capture/separation of carbon dioxide, and catalytic removal of harmful industrial materials. Hyehyun Kim, Minhak Oh, Dongwook Kim, Jeongin Park, Junmo Seong, Sang Kyu Kwak and Myoung Soo Lah* Chem. Commun., 2015, 51, 3678. "Supermolecular Building Approach for the Design and Construction of Metal-Organic Frameworks"
Chem. Soc. Rev., 2014, 43, 6141. "Post-synthetic Modifications of Framework Metal Ions in Isostructural Metal–organic Frameworks: Core-shell Heterostructures via Selective Transmetalations"
Chem. Mater. 2012, 24, 3065. "A Foldamer-Based Chiroptical Molecular Switch That Displays the Complete Inversion of the Helical Sense upon Anion Binding"
J. Am. Chem. Soc. 2011, 133, 13938. J. Am. Chem. Soc. 2007, 129, 14142. J. Am. Chem. Soc. 2006, 128, 3530.